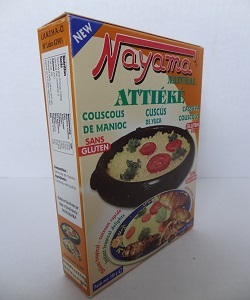 Attieke (also spelled acheke) or couscous de manioc is a side dish made from cassava that is a part of the cuisine of Côte d'Ivoire in Africa. The dish is prepared from fermented cassava pulp that has been grated or granulated. 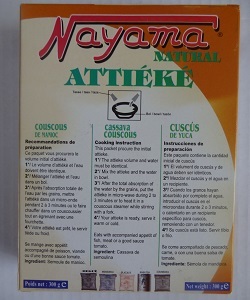 Dried attiéké is also prepared, which is similar in texture to couscous. It's a common and traditional dish in Côte d'Ivoire that originated in the southern part of the country, and methods for its production are well known in Côte d'Ivoire and also in Benin. 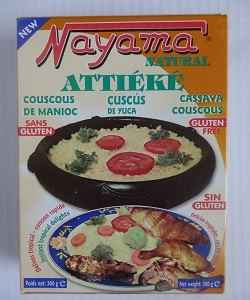 In Côte d'Ivoire, the dish is often served with Kedjenou, a slow-cooked stew. 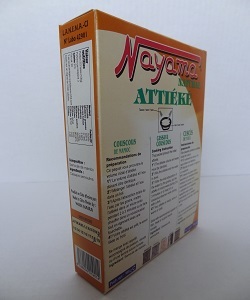 Fresh attiéké can spoil quickly, and should generally be consumed within 24 hours after preparation.